You know that expression “pay it forward”? Coined long ago, the idea behind it was that the beneficiary of a good deed would repay their “debt” by doing a good deed for someone else. A pretty simple concept. While I think many are true to the intent of the expression, there are those who take the word “pay” a little too literally. Take for example, this story about a Starbucks in Florida. Over 450 people purchased a drink for the person behind them in the drive-through line until one man deliberately ended the “pay it forward” chain, believing people were participating out of guilt, rather than generosity! In Georgia, a rule banned do-gooders at a toll booth from paying the tab for the car behind them due to complaints that the money was not actually getting paid forward, but allegedly ending up in the cashiers pockets. Is this what “pay it forward” is all about? I am the recent recipient of an act of kindness which doesn’t involve money, a Frappuccino or a toll booth. It does require me to “offer it forward” as I am going to say from now on. Of course, I could figure out how to repay my debt pretty quickly, especially at this time of year. Yet, this act of kindness was so meaningful to me, and had a particular spirit behind it, that I think I will take my time figuring out my next step. I was dreading an appointment on my calendar. I was so afraid. Perhaps my fear was unfounded, but it was real and I had been living with it for quite some time. I just couldn’t shake it, as strong as I pretend to be. I had debated asking a friend to come with me, but decided against it as it was the holidays and a busy time. I happened to be speaking with my friend Ann whom you met here about five days prior and spontaneously decided to confide in her how I had been feeling. Ann has a nursing background and works as a healthcare consultant. We have been friends for almost 20 years, meeting for the first time when we were almost eight months pregnant with our first babies. She is one of my “sister friends” as I like to call them (I don’t have sisters of my own). We’ve had a lot of fun together through the years, including the time I got to do this, at Ann’s invitation (so embarassing to watch now – how many times did I repeat myself!). Ann was the right person to speak with about my fear. She listened to my concerns and did not try to diminish my feelings. She simply said, “Do you want me to come with you?”. It makes me cry when I think about it because it might be one of the nicest things anyone has ever done for me. She was offering herself, her time and her strength to me at a time when I really needed someone’s support. I gratefully accepted her offer. Ann, and we hopefully all have Anns in our life, is the person you want in the room when the chips are down. She is upbeat, positive, has a wonderful laugh and evokes a ray of confidence that things are going to be ok. She gave me the pep talk I needed in the car, negotiated her way into the waiting room and distracted me with her iPhone apps and conversation about our high school seniors. When I fortunately got the green light to come back in another year, we hugged. You can probably figure out what appointment this was as I am a woman of a certain age. Every day is a gift and I do not take it for granted. So with a renewed focus, I am going to offer Ann’s kindness forward. I am going to walk with someone when they are afraid and help them navigate a difficult day or time in their life. Maybe, we could start our own Starbucks-type chain with the simple idea that no man (or woman) needs to be an island. Nobody needs to stand alone. I definitely don’t have the answers. But what I do know is that offering it forward is not about money. Offering it forward is the opportunity to give your greatest gifts – yourself and your time – to someone who needs it most or even just a little, especially at this time of year when emotions are high and spirits can sometimes be low. And so thank you, Ann. 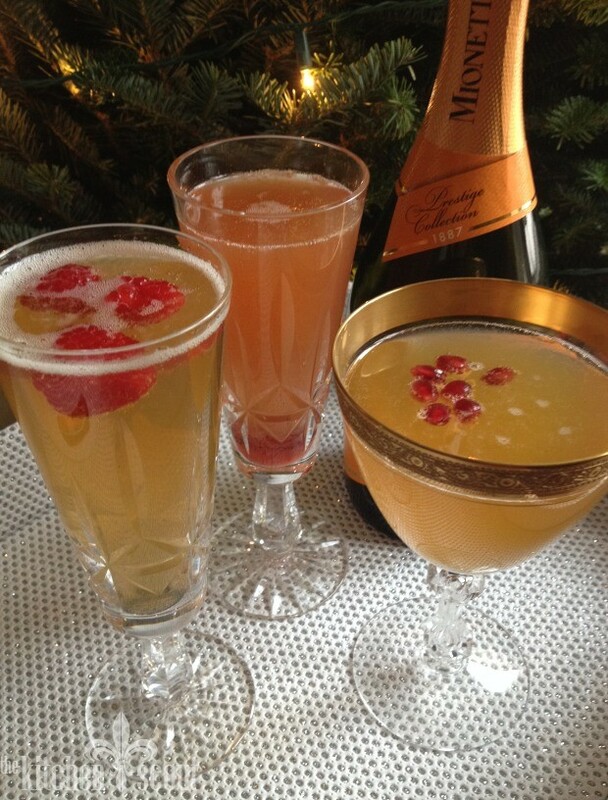 You helped me through a difficult day and since it is the season of celebration, I am sharing a recipe for a champagne cocktail which I hope you and others will enjoy. It’s a Bobby Flay recipe and it caught my attention as it combines Bourbon, the spirit of the moment which my husband enjoys, with my favorite, Champagne or Prosecco. In our house, that’s a his and hers winner. It’s bright from the Prosecco with a warmth from the bourbon and a touch of sweetness from a vanilla bean simple syrup. I made it for some friends last weekend, and its unique flavor was enjoyed by men and women alike. This week I played around and made an orange-vanilla syrup and a blood orange-vanilla syrup. I’m not sure which one I liked the best, but it might have been the orange-vanilla! I hope you get a chance to make one sometime soon and share it with people you love. Combine the sugar, water (or orange juice or blood orange juice), bean and seeds (or paste) in small pot. Bring to a boil over medium heat and cook until the sugar is dissolved. Let cool to room temperature, then discard the vanilla bean if using. 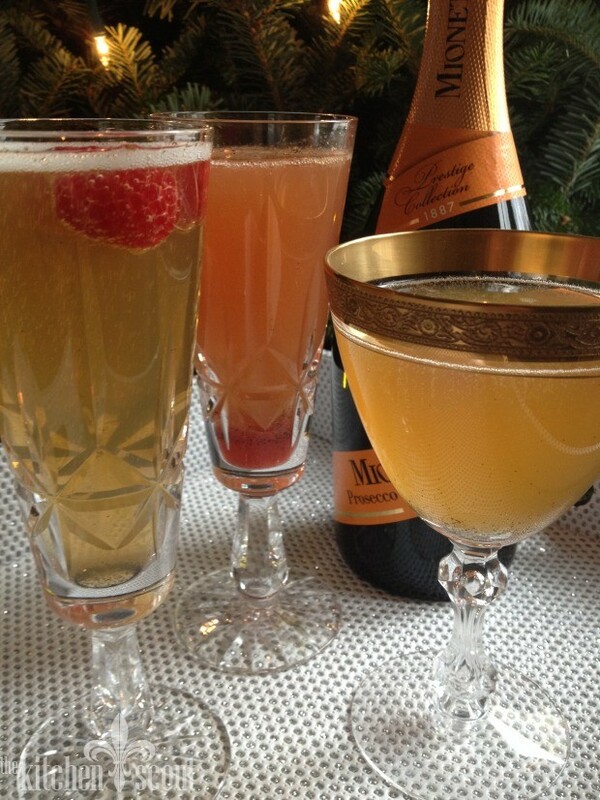 Add 1 shot (1-1 1/2 ounces) of bourbon and 2 Tablespoons of syrup to a chilled champagne flute (I use a 6 ounce flute). Fill to the top with Prosecco or Champagne. Garnish with a few raspberries or pomegranate seeds and serve. I have found Vanilla Paste at William Sonoma and at some supermarkets. It's on the shelf with vanilla extract and vanilla beans. It is a great alternative to vanilla beans. The syrup should make about 6 cocktails. The recipe can easily be doubled and you could use leftover syrup on pancakes or waffles. Thanks Val. So true. Feel lucky and blessed to have more than one “ann” in my life. Best to you.